BRANDS HATCH, England – It’s been just over a week now since we first arrived in London and I think we are finally getting the hang of it. The hardest part about this trip so far has been the traveling, which we now realize is the easiest part! Day two we set off from London to Cliff Dempsey Racing in Corby, not knowing anything about the “Tube” (the London Undergound) or any trains for that matter; we were very confused and stressed at some points. An 09:24 departure time is what my ticket said to go from Vauxhall station to Kings Cross station on the Tube, then an 11:00 departure time for the “regular” train from St. Pancras to Corby. Not knowing that our tickets were valid for almost anytime that day, we sprinted just over a half-mile to the Tube and barely made our 09:24 departure time! As of now we have traveled almost the whole city and realize how easy it actually is. Prepping the cars at Cliff Dempsey’s shop. Arriving in Corby, Oliver and I were extremely happy to get our first train voyage over with. We were kindly met by Michelle Dempsey, who then chauffeured us the short distance to Cliff Dempsey Racing. From the dated pictures and trophies on the walls to an old FF car Cliff ran when he raced, you can sense the knowledge and passion the Dempsey family has for the sport with everything that they do. 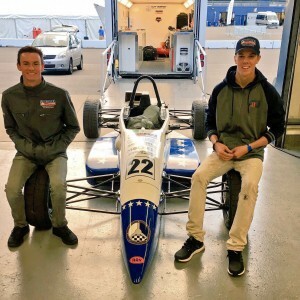 After a quick and easy seat fitting with some Team USA Scholarship sponsor stickers added to the cars, we were ready to travel to Silverstone. Our first test day consisted of four 40-minute sessions. One was fully wet, one was mostly wet, and two of them were dry. My first impression of the FF car was “wow, this is unlike anything I have ever driven.” The feeling is hard to explain, but I do know the car is very unforgiving and seems to magnify ANY little mistake you make. Fortunately, it quickly became clear that Cliff has the setup for the cars down to a science. Before we would even go on track he would know exactly what we would say about the balance of the car! We ended the day on a good note with both Oliver and I within a tenth of each other, and then we set off back to Corby to test the next day at Rockingham. Day two of testing was a private test on probably the most technical track I’ve been on. The inner portion of Rockingham has lots of high speed, fourth-gear, nearly flat-out corners, which you need lots of confidence to be able to drive. Although it was a great day with plenty of laps, the technicality of the track did catch up to me at one point when I had a hiccup which sent me into the gravel trap in last corner named “Tarzan.” Luckily, it was no big deal, and once again we learned a lot during the day. We then headed back to London on the train – this time with no trouble at all! Sunday and Monday we spent most of our time touring London and doing some sightseeing, with some laundry mixed in of course. Although it rains on and off constantly, I would have to say this is probably my favorite city I’ve been to. I typically despise being in large cities, but this one has a different atmosphere to it. 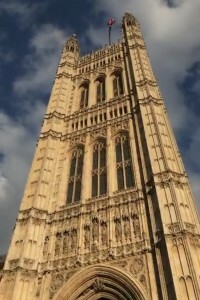 All the old English architecture is immaculate and jaw-dropping and I think that’s what makes me so fond of it. 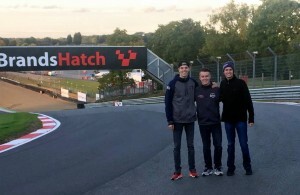 During our track walk today at Brands Hatch with Team Canada’s Parker Thompson. Today we made the trip to Brands Hatch, which isn’t far from London, and we have just completed a tour of the facility and a track walk. I would have to say that all the pictures and videos you will see do the track NO justice. It’s absolutely stunning. The amount of elevation in Turn One (Paddock Hill Bend) is HUGE and almost scary when you walk down it for the first time! Now we’re finishing up preparation of the cars and tent, and are ready to get a good night’s rest before our first session early in the morning. 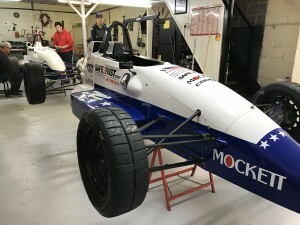 I cannot wait to get back in the car and I will keep you all updated on what happens through the weekend at the Formula Ford Festival!